Despite all the panic from bears today, thus far the wave 2 snap-back rally has been only slightly more energetic than we anticipated. Our target of 1195 has been met and marginally exceeded. 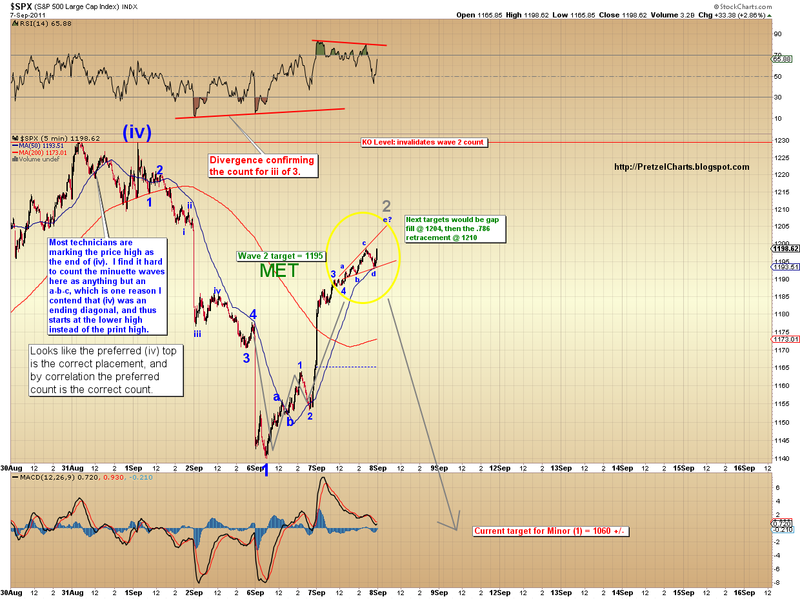 Barring immediate reversal, our next targets would be the gap at 1204, then the .786 retracement at 1210. 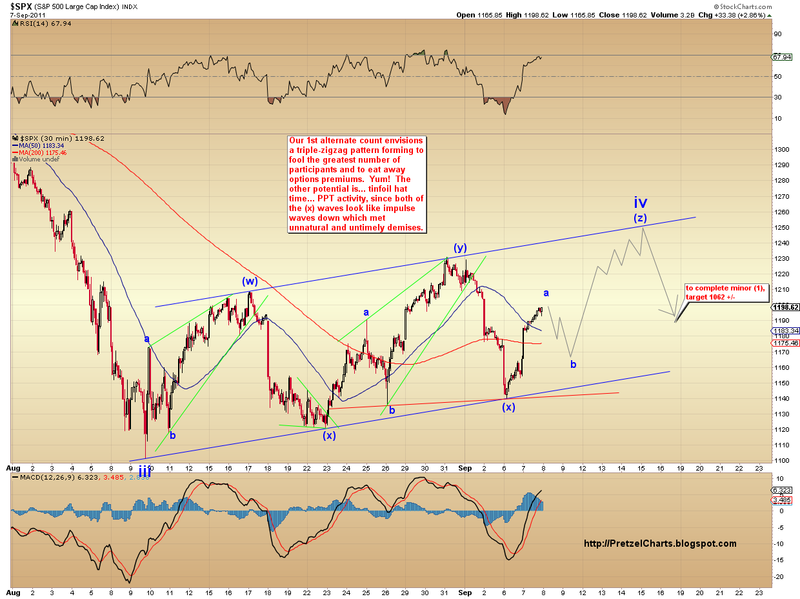 Keep in mind that 2nd waves can retrace up to, but not over, 100% and still be within the guidelines. I'm not terribly pleased with the labels on the ending formation of this wave, since it currently counts best as an expanding ending diagonal. This is such a rare formation as to be almost non-existent, placing it in the same category with things such as pregnant virgins, government spending-restraint, and super-smart statements from Paris Hilton. Tomorrow's action should clarify the wave currently labeled "a-b-c-d-e?" as the next few squiggles will reveal to us what the pattern actually is. We are still unable to rule out our alternate counts, as until the key levels are broken either to the upside or downside, this could all be nothing more than noise. 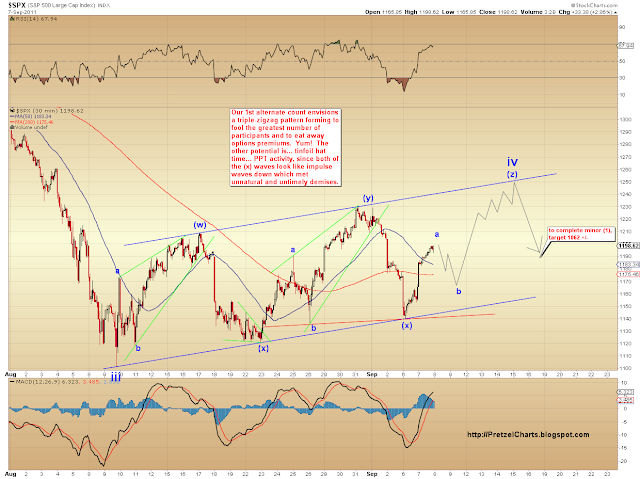 Our 1st alternate count would be that we are forming a w-x-y-x-z triple zigzag for wave iv, with w-x-y-x being complete (see 2nd chart below). This would take the current wave up to a marginal new high before we drop. 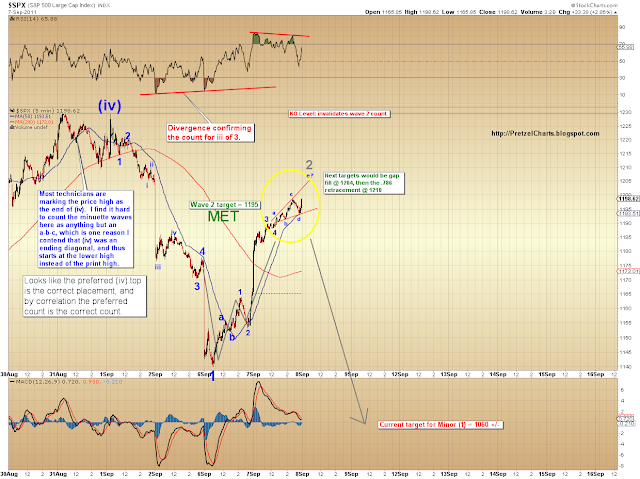 Our 2nd alternate would be that we bottomed Minor 1 at 1121 in a truncated 5th wave, and this is part of the Minor 2 rally. We have no reason to give any credence to either alternate count at this point, but it always pays to be aware of the possibilities.